Why such errors pop up? These error messages are an indications of accessing rights set in Lotus Notes Access Control List (ACL). Access Control List is a feature in Lotus Notes through which the administrator assigns the permissions for reading, writing and executing a specific operation. Access Control List has access control specifications for users, their roles and the permissions as a string of bits called access masks. The simplest solution to avoid or rectify such errors is assigning the permissions to the users for specific functions (those were denied earlier) or setting Notes database free of any access rights or permissions via Manage Directory ACL. And there could be a condition where there is a requirement for accessing the NSF database. Such a situation urges the need for a robust and advanced Local Security Removal Software for NSF database. After removing the local securities, the user can access the NSF database files and perform all operations on it without any restrictions. The software that can be trusted blindly for such an operation is Kernel for NSF Local Security Removal Software. Why Kernel for NSF Local Security Removal Software? The software fixes access restriction error messages. The best feature of the tool is that it removes local securities from the NSF database, without removing or modifying the encryption from the file. All the above, it shows compatibility with all versions of Lotus Notes application. You can have the evaluation version of NSF Local Security Removal Software that can remove restrictions from file size up to 5 MB. It is absolutely free of cost. 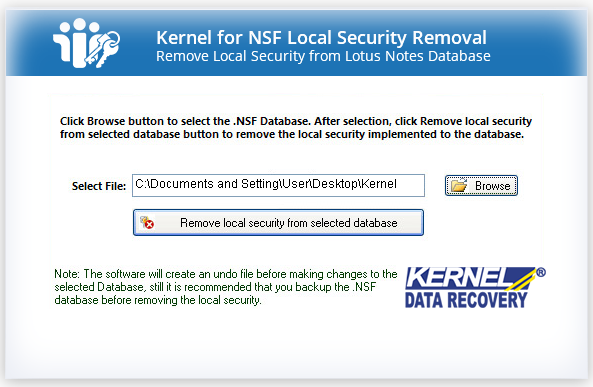 However, for performing security restrictions removal on large NSF files (more than 5 MB in size), purchase the full version of Kernel for NSF Local Security Removal Software. Being unable to access Lotus Notes database and work on it is a serious issue. The file permissions should be checked if the error pops up. The required access permissions can be provided from Manage Directory ACL. But the quick need for NSF database data may drive you to look for a software that automatically removes any restrictions on a user for accessing the particular database. Think of using Kernel for NSF Local Security Removal Software in that case.